One of the most famous sites in the Medieval center is this building corner on which these odd statues/gargoyles stand guard: Vannes and his wife. Mr. Vannes and his wife are certainly worth seeing, but the town of Vannes is the real star. Or should I say, the town of Gwened. Here in the land of the Bretons, with their language and culture so closely tied to the Gaelic from the British Isles, there are a lot of words that seem entirely unrelated to the French versions. The word for "Breton" or "Bretagne" itself is "Breizh" -- pronounced "brez". Everywhere we look, there seem to be Zs and Ks and unusual letter combinations. This is the ancient shop of Guenhaël. What would that be in French: Guinevere? Guillaume? Raphaël? It could be anything. If you don't know how to pronounce Guenhaël, you're not alone. Now try "kouign amann", the local Breton treat made with about a billion kilos of butter compressed into each snail-shaped pastry. It's a tongue twister: "kween ya-MANN". Here, we buy the 1st prize, award-winning kouign amann of Bretagne. Who are we to argue with the Regional Federation of Breton Bakers? Bretagne is famous for its galettes and crêpes, which are also butter-heavy and cream-rich. Here Anthony tries to combat some of the butter of the day by ordering a vegetarian galette. And Gigi tries to add to the butter of the day with a hot chocolate gourmand multi-dessert platter. Food is better, cheaper, and butterier out here away from Paris (for casual food in particular). For me, though, the real star of Vannes is the architecture. I'm besotted with all the colorful colombage and the wonky building shapes. By the way, this is not me holding the camera crooked; this is medieval construction and the effects of time. Part of the old protective walls still stand (and our girls handstand in front of what's standing), and you get a nice view of it from the Jardin des Remparts (Garden of the Ramparts). 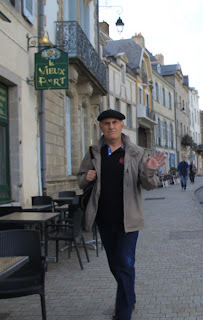 Vannes is the kind of place where you'll see an honest-to-goodness Frenchman in a beret, to keep his head warm and not for effect, and you'll also see people in local costumes playing the bagpipes. Is it France, or is it Bretagne? In fact, Bretagne has not always been part of France. Here, in the center of town, that's made clear with a town square honoring King Henry IV, a 16th century King of France, and a street honoring Saint Salomon, a 9th century King of Bretagne. In reality, Vannes' history goes back much further than this -- 2000 years to Roman times. And even beyond that: Nearby are Neolithic stone sites (à la Stonehenge, but obviously not as famous). We do not visit the Dolmens, as the stone sites are called, this time around, since we haven't rented a car and we find there's so much to do closer to town. Also, the girls start moaning when I suggest it, "Not rocks in a field! Nooooooo!" 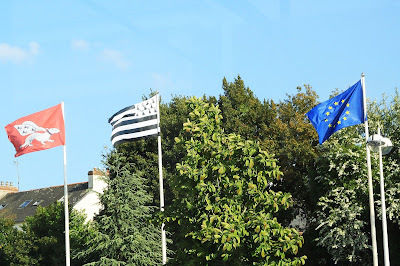 Bretagne is a place that's so proud of its heritage that in Pippa's 5th grade (CM2) class, when they once discussed heritage and the teacher asked which of the kids had parents who were not from France, Pippa's best friend raised her hand: "Mine are Breton!" Here, the souvenirs are not decorated with Eiffel Towers to symbolize France but rather the local black and white flag, various Breton symbols (which look very Celtic), and the name Breizh. Tomme de Bretagne is, as the name suggests, made in Bretagne. Specifically, it's an organic, artisanal raw cows' milk cheese made in the L'Ille-et-Vilaine department, in Bain-de-Bretagne, between Redon and Rennes which are just inland from Vannes. The Tomme de Bretagne is made at Fromagerie La Caprarius, which -- by the name -- you would expect to be a goat farm. In fact, it makes and sells sheep and cow cheeses also. This is their Tomme de Vache, which is sold at the fabulous Kerouzine fromagerie in Vannes, where it was named Tomme de Bretagne in order to reflect its heritage and distinguish it from other tommes. But amazingly -- shockingly! -- whether you call it Tomme de Bretagne or Tomme de Vache, I haven't officially covered it yet for A Year in Fromage. I'm happy to cover it now. It's a classic, semi-hard cow cheese, mild but with a tang of lemon and a must of mushrooms. It's soft, a little chewy and creamy, with a rugged, rustic crust that I eat, but many people probably won't. I got this cheese at the fabulous cheese shop Kerouzine (with the letter Z, naturally) in Vannes. It's an almost unbearably cute cheese shop in this almost unbearably cute town. For example, if you want some bread to go with your cheese, look no further than across the street at the organic, proud-to-be-Breton bakery. The fromagerie is not just, um, shall we say, fragrant, it's also colorful and a fine place for both a gorgeous cheese and a pretty portrait. I like their little terrarium of "antiquities" for sale. Yum. If I just had some day-old bread to go with those month-old cheeses. Oh, that's right: I can get some across the street. Just as Vannes is overloaded with charm, butter, and foreign Gaelic spellings, this cheese and cheese shops are overloaded with flavor, cream, and the letter Z. Tomme de Bretagne for a new favorite spot in Bretagne. So interesting. Those buildings look amazing. Looks like you are building wonderful memories with your family. Thank you for sharing!